As the name suggests, age-related macular degeneration (AMD) is more common in older folks. But it's not just age that raises your chances of getting the disease. Some things that are linked to AMD are out of your control, like the genes that your parents passed down to you. Others, like smoking, diet, or high blood pressure, are things you can do something about. There are two types of AMD, dry and wet. Both can lead to vision problems, so learn as much as you can about the causes of the disease and the steps you can take to keep your eyes healthy. About 85% to 90% of people with age-related macular degeneration have dry AMD. The condition is linked with bits of fat and protein called drusen. They can collect under your retina -- a layer of tissue at the back of your eye that processes light. No one knows where the drusen come from, but they are thought to be pieces of waste from the retina. If you're over the age of 50 you probably have some hard drusen in your eyes. These are normal and harmless, especially if they aren't in your macula -- the small area at the center of your retina. But soft, large, and centrally located macular drusen are not. They are the ones that are linked with losing your vision. Drusen in early AMD are quite small. They get larger as the condition moves from early to intermediate to advanced. In advanced-stage AMD, drusen are larger and more numerous. They keep oxygen from reaching your eye. The vision loss from dry AMD happens slowly and usually is not as severe as that from wet AMD. But dry AMD can sometimes turn into the wet form. Up to 5% of people who have dry AMD in both eyes will get wet AMD in a year, while 13% to 18% will get it in 3 years. Wet AMD usually gets worse much more quickly than dry AMD. If you have this type, extra blood vessels start to form in your eye underneath the macula. These new vessels tend to leak blood and other fluid into your eye, which causes damage. It's not clear exactly why the vessels form, although some experts think it may be part of an effort to get rid of the drusen. What Raises Your Risk for AMD? Scientists have identified 20 or so genes which may be linked to more than half of AMD cases. This helps explain why you have a higher risk of AMD if other members of your family have it. But genes aren't the whole story. There are other things that may combine with genes to raise your chances of getting AMD. Age. This is the No. 1 thing that puts you at risk for AMD. About 2% of people in their 50s have AMD, and almost a third of people over 75 do. Race and ethnicity. Whites have the highest risk of AMD, followed by Chinese and Hispanic/Latino people and, with the least risk, African-Americans. Whites are also more likely to go blind from AMD than African-Americans. About a third of whites have a gene that's been linked with AMD. If you have light-colored eyes, you also have greater odds of developing dry AMD, possibly because light eyes don't deflect ultraviolet rays as well as dark eyes. Gender. About 2/3 of people with AMD are women and 1/3 men. This may be because women live longer than men. Smoking. If you smoke, your risk for AMD could be up to four times as much as someone who has never smoked. This is probably because smoking reduces the amount of oxygen that goes to different parts of your body, including your eyes. High blood pressure. Like smoking, high blood pressure restricts the amount of oxygen getting to your eyes, which may raise your risk for AMD. Heart disease. If you've had a stroke, angina (a type of chest pain), or a heart attack, your risk for AMD may be 1 1/2 times as high as someone who has not had any of these problems. High cholesterol levels may also raise your risk. Obesity. Some studies suggest that if you have a body mass index over 30 it can more than double your chances of AMD, although this is not yet proven. Spending too much time in the sun. Long-term damage to your eyes from the sun's ultraviolet rays may raise your odds of AMD, though this is also not certain. Medications. Some drugs may be linked with chances of AMD. Those include aspirin and certain heart drugs including nitroglycerin and some beta-blockers, although this isn't certain. You should talk about the use of these medications with your doctor. Diet and alcohol. High-fat, high-sugar diets that skimp on green leafy vegetables may also add to your risk for AMD, as does having more than three alcoholic drinks a day. Cataract surgery. Your chances of getting AMD may go up if you've had this eye operation. AMD in one eye. Macular degeneration in one eye means you are more likely to get it in the other eye as well. U.S. National Library of Medicine: "Macular Degeneration." Bright Focus Foundation: "Prevention & Risk Factors." 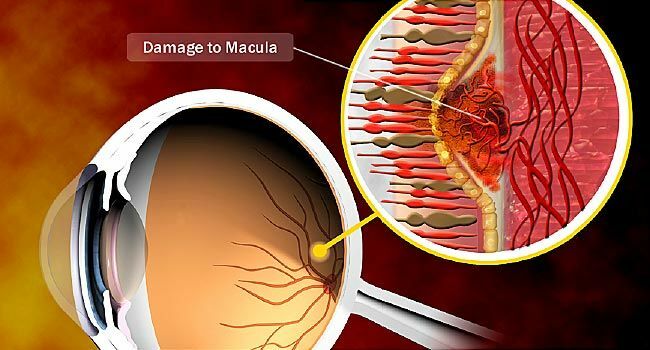 National institutes of Health Senior Health: "Age-Related Macular Degeneration." National Health Service UK: "Macular Degeneration - Causes"
UptoDate: "Age-related macular degeneration: Clinical presentation, etiology, and diagnosis," "Cataract in adults." National Eye Institute: "Facts About Age-Related Macular Degeneration," "Age-Related Macular Degeneration (AMD)." American Academy of Ophthalmology: "Who is at Risk for Macular Degeneration?"